In the medical & pharmaceutical device industry, quality is of the utmost importance. With one’s health and safety at hand, liability and full part traceability — from design to final inspection — are crucial when choosing a medical equipment parts manufacturer. Engineering-grade plastic resins offer excellent mechanical properties, including high tensile strength, high-temperature resistance, and tolerances matching those of metal — all ideal properties for the demanding nature of medical assemblies. In addition to reducing part weight, material waste, lead time, and overall cost, plastic injection molding also offers superior design flexibility. At Rodon, we work with uncolored virgin material, allowing us to offer a variety of part colors and styles in order to meet the unique needs of your application. Offering high-volume medical injection molding, our team creates precision-built molds to allow for high repeatability, ensuring optimal part quality over long production runs. We have a press range extending from 46 to 400 tons, with the ability to uphold tight tolerances on high-volume orders. Our energy-efficient machines and highly automated facility — complete with a robot supporting every piece of equipment — enable us to reduce high production and manual labor costs, in turn providing price-competitive solutions for all our customers. We achieve this optimized efficiency without ever sacrificing product quality. Working with plastic rather than metal allows for superior physical and chemical properties. By using engineering-grade plastics, we can minimize patient risks while meeting strict FDA standards. To see an example of our work in the medical industry, check out this case study documenting how we optimized the mold design for a polystyrene diagnostic kit. 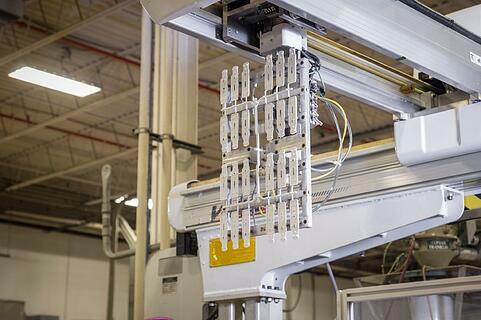 You’ll also learn about how our custom capabilities — such as machine vision inspection — guarantee quality, cost efficiency, and 100% reliability for every order we complete.